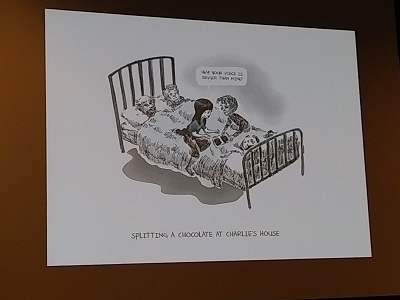 ALA Annual Conference 2018 – Meeting with the Newbery Committee!!! 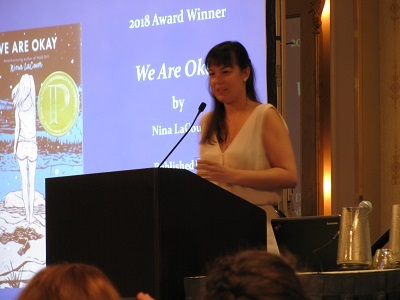 On Saturday from 1:00 to 5:30 and Sunday from 8:30 to 11:30 – I met with the 2019 Newbery committee! On Saturday we talked about logistics. We went over the manual, looking hard at the criteria, reminding ourselves what we’re looking at, and what’s eligible and what’s not. 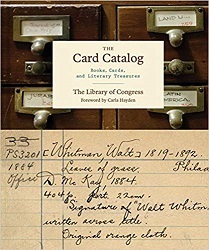 We talked about the nominating process – We will each nominate 3 books in September, 2 in October, and 2 in December, while continuing to suggest books. But only the nominated books will be discussed in Seattle. In Seattle next January, we’re going to meet for preliminaries on Thursday evening, then meet all day in a locked room on Friday, Saturday, and Sunday. We have to have our decision made by Sunday afternoon. We’ll get up early on Monday morning and call the author. Our chair told us that ALSC is going to mail a locked trunk to the conference. 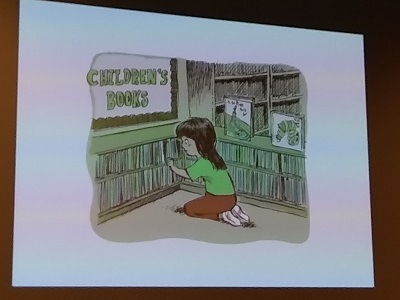 It will contain all the books that were nominated by committee members – the only books we’ll be discussing. There is one key to the trunk, and our chair will be the one who has it! We also discussed tricks for reading nominated books on the plane ride to Seattle. I liked the idea of taking off the book cover and replacing it with a cover from an older book. Top secret! At the end of the discussions – I may not exactly have 14 new best friends, but do have 14 new friends, and I am part of a Team that works together well, and I’m super excited about the selections we’re going to make together next January! Middle grade books (or parts of books): 143, a total of 29,466 pages. Young adult books (or parts of books): 43, a total of 12,765 pages. Picture books: 293, a total of 11,002 pages. Grand total: 479 books, 53,233 pages. And I need to read a whole lot more than that before the end of the year! Better get busy! Henry Holt and Company, 2017. First published in the United Kingdom in 2015. 28 pages. Rhyming picture books are often awful. 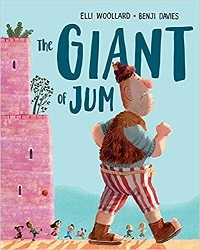 But when done right – like The Giant of Jum — they beg to be read aloud. who was constantly grizzling and grumbling. “Fee!” he said, and “Fi!” he said, and “Fo!” he said, and “Fum! How I pine, how I wish, for a child on a dish. So he sets out to find some tasty children. He continues to say those four syllables, but in a different order each time – resulting in a nice rhyme. He does find children, and they are delighted to have some tall about. Why, he can help them get their ball down from the top of a fountain and rescue their cat from a tree! The ending is reminiscent of Troll and the Oliver — because when someone thinks he’s hungry for children, who wouldn’t be happier with cake? This one isn’t terribly profound, and there may be a few holes in the story – but it sure is fun to read. I’m going to set it aside for storytime. 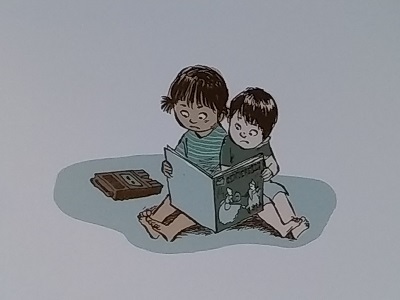 On Saturday of ALA Annual Conference, I went to an excellent session given by illustrator LeUyen Pham. It was her story – not about one of her current books. So I think I can post the notes. She’s come to a place in her life where she wants kids to see the face behind the books. So many kids out there need voices like this. 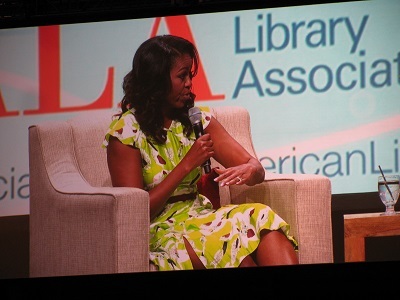 She talked about her childhood and how children’s books shaped her. At 9 years old, she was terrified of Where the Wild Things Are. Her father loved to watch war movies with his kids, and she had just watched Apocalypse Now. The images of the wild rumpus made her think of Vietnam. To her Max was a kid lost in a very real jungle. 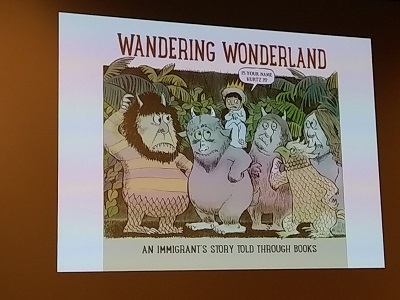 It was tough to find a book a little immigrant girl would relate to. She took books as a chance to help parse the culture. She was only 2 when they left Vietnam. She didn’t know much about the war. She didn’t know much about her own culture, let alone about American culture. TV was confusion – reflection of culture without explanation. Books, though, let her into the secret world of westerners. 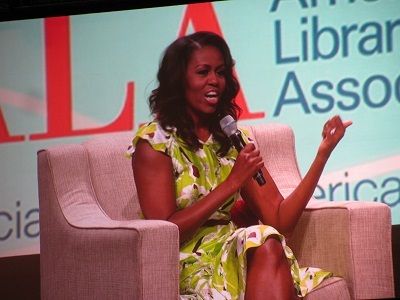 She thanks the teachers and librarians who knew the kid she was inside. She loved The Witch of Blackbird Pond because she was an outsider like Kit. She loved The Westing Game because she loved puzzles. She wasn’t given books about Asian girls just because she was an Asian girl. She’s not claiming her story speaks for anyone but herself. Her mother read them books about Vietnamese princesses – who had it rough! When they finally read the Disney Cinderella – it was a big disappointment with no gruesome death for the stepsisters. She loved reading aloud in class – that was the only place she’d get her pronunciation corrected. She loved Charlie’s house in Charlie and the Chocolate Factory. She understood that being poor makes you an outsider, too. Like Charlie, they had to prove their worth. Ramona and Her Father was an eye-opener. Even Ramona could be perplexed by her father. She read A Little Princess over and over and over. Mostly because she loved her doll Emily. She wanted a doll – to be named Jenny. After a big disappointment – her father got her the doll. She talked about her teacher Miss Sangren, who gave her a new book every week. Like Kit in The Witch of Blackbird Pond, she called her a tropical flower in a world of daisies and roses. She related to Charlotte’s Web differently than the rest of her class. Especially after the quails she had named before her mother cooked them. When it came to Wilbur, she was pretty jaded! In The Westing Game, Turtle reminded her of herself, getting by on smarts, not on looks. She’s still growing through books. Harry Potter is painfully relevant since the election. Her approach has changed since the election. 2017 was a year of anxiety, which made working tough. In 2018, we’re fighting to redefine this country again. Poverty is actually the biggest divider of our nation. Paint the world you want to see for all these kids. 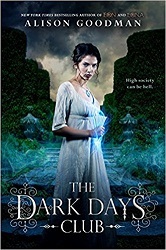 This book is one of my favorite kinds – a Regency novel with magic thrown in. We’re introduced to Lady Helen Wrexhall, eighteen years old and getting ready for her Royal presentation. Lady Helen is an orphan, and her mother died with the cloud of treason over her name. Helen lives with her aunt and uncle, who want her to curb any impulses to be anything like her mother. Lady Helen has recently noticed herself extra excitable and restless. Then she meets Lord Carlston, about whom rumors swirl that he killed his wife. Lord Carlston believes that Helen, like her mother, is a Reclaimer – one of eight people in England who is able to fight the thousands of Deceivers who feed on the souls of others. Lady Helen indeed discovers unusual powers. And when she holds the miniature her mother left her, she is able to see Deceivers. She witnesses the shocking scene of Lord Carlston fighting a Deceiver. He tells about the Dark Days Club – a group of people who work with the Reclaimers to fight the Deceivers and save humankind. But meanwhile, her aunt and uncle and brother know nothing of this and are intent that Helen should be seeking a husband. They continue with preparations for her Royal presentation and her ball. The two worlds are at odds and one is very dangerous. Then Helen receives a letter her mother left for her and discovers that she may have a choice as to which world she wishes to remain in. This novel is clearly just the first of a series – and I definitely want to find out what happens next. Regency plus magic is one of my favorite genres. There’s still romantic tension going on, as well as real peril associated with the activities of Reclaimers. She is a Direct Inheritor from her mother, so it is believed this means a Grand Deceiver will arise, and Helen needs to fight them. It will be very interesting to see how this develops. 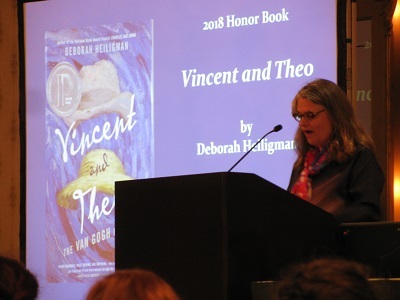 Deborah Heiligman doesn’t remember receiving the Printz call. “Apparently, I screamed.” She told us the story of getting Transient Global Amnesia. She started asking “What just happened? What’s going on?” She was agitated and confused. She could only remember for 90 seconds at a time. 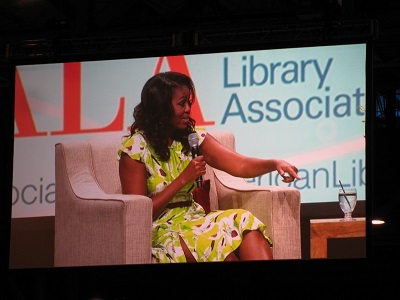 This is why she missed the YALSA Nonfiction Awards in Denver. It turns out that TGA can be caused by strong emotion. Is the moral to “try not to get too excited”? Vincent painted for art’s sake – and Theo’s approval. Vincent was a great artist in spite of his mental illness. We want to leave the world a souvenir. Wake someone up to the world. But Hope isn’t something you decide not to have. Hope is all surly and defiant. Usually good news comes in pieces, over time, with assembly required. With Fantasy, recognition feels extra good, since Fantasy is often dismissed. Shame is heavy — but it is a safeguard. It says decency is real and lines exist. Our government is being shameless and erasing lines. The thought of her 8-year-old daughter being separated from her makes her lose her mind. 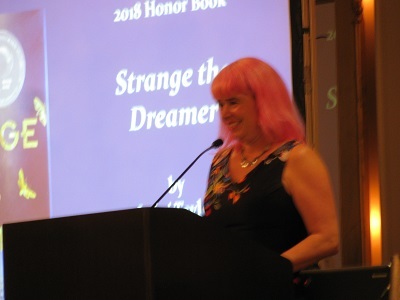 Strange the Dreamer hinges on whether it’s possible to save a traumatized child from her consuming hatred. As long as there’s even one dreamer left — there’s hope. This past week has been trying as horrific events unfold in our nation. 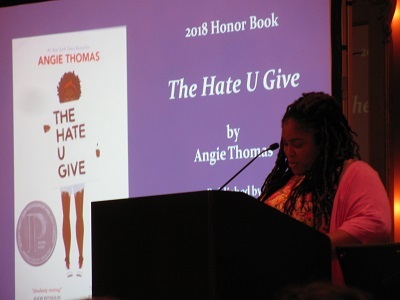 She can revive her characters with the stroke of a pen, but she can’t revive Antwone Rose, who was gunned down this week in Pittsburgh. In fiction, she can delete injustice. We should not live in a world where children become activists. Kids shouldn’t have to tell us we need to change. What children’s literature has always shown is that anyone can be a superhero. Yes, even you. Let’s not leave the work all on them. Acknowledge the injustice around you to the point it angers and exhausts you. There are good writers and good storytellers, not so many people are both. He wants people to read his books more than once. 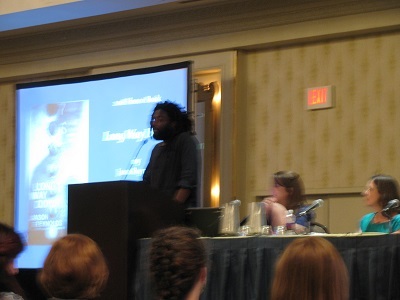 He’s proud to win a Printz Honor, especially since the first Printz winner was Walter Dean Myers. This book was a passion project. Based on when he was a 19-year-old college kid in 2003. His mom was engulfed in the flames of cancer. A friend called and told him that their friend had been murdered. He remembers the blade of grief. He remembers the anguish of their friend’s mother. All his friends are missing parts of themselves – like cancer. The death changed them chemically. They realized they could do what they couldn’t do before – they could kill. This book is about the weight of anger, or the rules, but also the weight of cages, the weight of separation, the weight of us. The fate of a child is in your hands. Now we’re certain his friend’s legacy will live on forever. This is the first time an Own Voices book about queer girls has won the Printz. We Are Okay is the product of a painful time. Her own grandfather died when she was hospitalized with preeclampsia. She had a vision of him pushing her on a swing and with his arms open wide in greeting. He grew up in New Orleans. Gramps in the novel is an altogether different man. 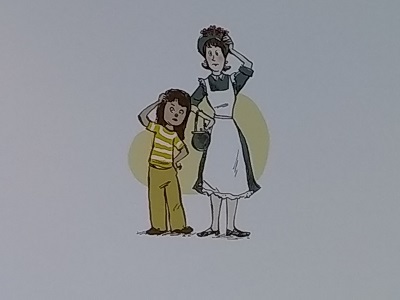 Since orphans are a trope in children’s literature, for her first few books, she did her best to keep the parents alive. Her own parents split soon after her baby was born, and it was as if her own past were erased. The big question of the book: When we don’t recognize our own past, what can anchor us? Creston Books, 2017. 52 pages. Oops! I didn’t look at the copyright date before I read this book. It’s new in the library, but it’s not eligible for the 2019 Newbery Medal, so I probably wouldn’t have read it if I’d noticed. As it is, I can’t even resist taking the time to review it, I enjoyed it so much. 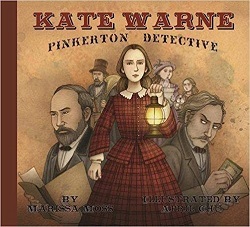 This book tells about the first case of the first female detective of the Pinkerton agency. Kate answered an ad to be a detective and was given an opportunity to prove herself. The story is told dramatically. Kate posed as someone whose husband was in jail in order to win the confidence of the wife of a thief – to get the evidence to prove he actually was a thief. It’s all done in the form of a picture book story, with clear and dramatic illustrations. The author’s note at the back adds more details about some of Kate’s other cases and her eventual role being in charge of more female agents. I was entertained as I read this story, wanting to know what would happen next. But I also learned about a woman who put herself forward and then rose to the challenge. 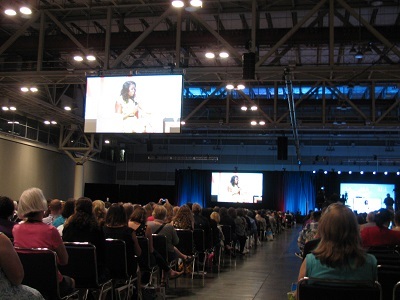 ALA Opening Session with Michelle Obama! 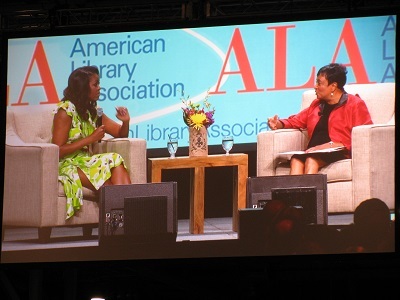 I spent last weekend at ALA Annual Conference in New Orleans, and one of the highlights was getting to hear Michelle Obama speak, interviewed by Carla Hayden, the Librarian of Congress. My flight was delayed almost 4 hours, so I didn’t think I’d make it. 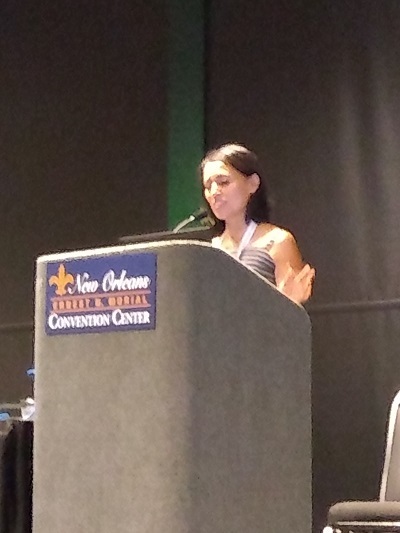 Fortunately, there was lots of Opening-Session talk first. I was way in back, but I was in the room! 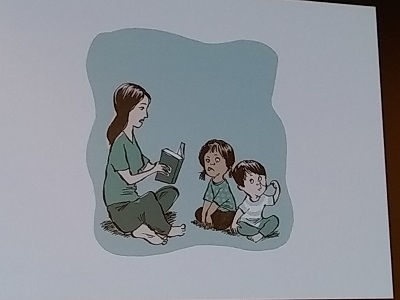 They began by talking about her background with books. Carla Hayden actually knew her from libraries in Chicago. Michelle said that she was the kind of kid who read to her stuffed animals. She remembers getting her first library card when she was four years old. The library was three blocks from their house, a community space. She needed the escape of story the last 10 years, but most reading happened on longer trips. She’s not an ebook reader. Even now that she’s writing, she likes to hold it, feel it, touch it. As a result, they have lots of books on shelves. Her husband won’t let her get rid of them. Her first real job was in a book bindery – doing the same thing over and over. It gave her respect for people who do work to pay the bills and don’t have the luxury of looking for their passion. Her father had MS, but faithfully went to his blue collar job. He put both his kids through Princeton. She’s who she is because of her parents. She knows from experience why affordable child care is crucial. Her mom stepped in to take care of her kids when she was desperate and ready to quit working. Her mom didn’t let anyone do her laundry at the White House – and she taught the girls to do their laundry. She kept them humble and focused on what was important. Michelle’s mother listened and didn’t try to solve her problems for her. Her responses would be things like, “What are you going to do?” and “You know what to do!” She taught that from an early age – listened to and encouraged her kids to contribute and solve their own problems. Michelle had many high-powered jobs before she was first lady. Had to switch from being an executive to being a spouse. Life is long. There are trade-offs that you make. After Sasha was born, when she was ready to quit working, she felt the freedom in an interview (with Sasha in the room) to say what she actually needed in her job because she was ready to quit. They gave it to her, much to her surprise. It’s not easy for women to tell someone we’re worth a lot. While writing her book, she’s been reliving these things and writing about them. There was no time to reflect in the White House. There was no room to make mistakes. They were laying the red carpet down for others to follow. On her first trip to Africa, all in a few days, she did pushups with Bishop Tutu, met Nelson Mandela, went on a safari, and gave a speech to a group of young women. Later on, she literally forgot that she’d ever been to Prague. 8 men with guns accompanied their teenage daughters everywhere. There is an upside to that for parents! Though they wanted their kids to have a normal childhood. If kids know you love them, you will be home for them. Kids are resilient. But there are a lot of broken kids out there — which shows that we need to do better. Give yourself a break. Your kids are loved. How do your kids interact in the world? They tried to teach their kids kindness, compassion, and empathy. Let kids see you be good people in the world. Kids want someone to tell them they’re okay. This could be the interaction that changes a kid’s life. Women tend to make ourselves a low priority. The oxygen mask metaphor is real. Michelle has a posse of women who keep her sane. She wants her daughters to see she has friends. They have been there for her since childhood, and when she was a new mother. She did a boot camp with friends at Camp David. Her girlfriends gave her support and fun. We aren’t meant to parent in isolation. We need community. Build your village. She wanted the White House to be a place of fun, especially during the tough times. While they were in the White House, they tried to do a lot of things for kids, bringing them in from all over the country. Every major star who came to the White House had to also do a performance for kids. They wanted to make sure kids of all backgrounds felt like the White House was a place kids were supposed to be. The kids felt like they were something special when they were in the White House. They did a mentoring program with 20 kids from DC – and saw a shift in who they thought they were. The program said, “You are worthy.” You are worthy of being talked to and listened to. If you can go in the White House, there’s no room you can’t enter. They gave that message to the young people who came. Her book, Becoming, is a re-humanization effort. A black woman from a working-class background doesn’t often have a chance to tell her story. We think there are only a handful of legitimate stories that make you a true American. Her book hopes to show the ordinariness of an extraordinary story. She’s not a unicorn. There are many out there like her. We’re all people with stories to tell. We need to know everyone’s stories. Americans are good, decent people. There are no devils out there. Maybe if we listen to each other’s stories, we can be more empathetic, inclusive, and forgiving. This is a nice quiet middle grade story with a touch of fantasy. It reminds me of Edward Eager books – dealing with wishes – except that it’s only one kid figuring out the wishes instead of a family of brothers and sisters. I like all the details in this book. Charlie (short for Charlotte) lives in a town where winters and long and cold and her neighbors like to go ice fishing. Charlie’s always been afraid to go far out on the ice – until one day at a hole in the ice at a shallow part of the lake, she catches a fish with sparkling green eyes. It promises her a wish if she releases it. Charlie thinks she must be imagining it, so she makes a frivolous wish – that Roberto Sullivan (the cutest boy in her school) will fall in love with her and that she won’t be afraid to go on the ice. Instantly, she is no longer afraid. She goes out on the ice with the others and catches more fish. She starts to forget about it – and then the next day at school Robert O’Sullivan – definitely not the cutest boy in the school – is crazy about her, embarrassing her with love notes. It turns out that when Charlie fishes at that hole in the ice, she usually catches the fish again – and is promised a wish if she releases it. She tries to help her friends – but wishes don’t always turn out exactly like you hope they will. And when she makes a wish for herself, it especially backfires. I love all the details in this book. Charlie competes in Irish dancing and wants to save money to get a solo dress for the competition. I knew nothing about Irish dancing or ice fishing. But the central problem of the book is that Charlie’s older sister who’s off at college turns out to be addicted to heroin. This book reveals how that affects Charlie and how much it affects her whole family. So what starts as a light-hearted book as Charlie is saving money for a dress and catching fish and having fun with friends – does delve into some heavier issues. But Kate Messner keeps things firmly from the 7th grade protagonist’s perspective. There is a message, done with a very light touch, about how hard it is to get out of heroin use once you’ve started. And that your life will be much better if you never start. The Serenity Prayer comes up frequently – Charlie does have to learn that she can’t magically fix her sister. Not even with a magic fish. 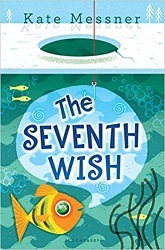 But mostly it’s a playful story about a seventh grade girl who finds a magic wishing fish. What would you say if a fish offered you a wish, and you had to come up with a good one in time to let it back in the water? Chronicle Books, 2017. 36 pages. It’s another beginning chapter book about Charlie and his little brother Mouse. In this book their grandfather, Grumpy, comes to visit. 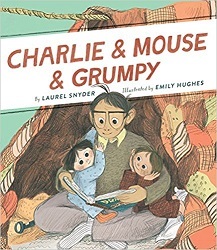 This book hits just the right note, telling about interactions of the boys with Grumpy. There are four short stories. The parents don’t come into it at all (except being referred to a bit), but each story is strictly between the boys and Grumpy. “Grumpy is here!” said Charlie. “Should we pounce him?” asked Mouse. Grumpy was in the kitchen. “Why are you sad?” Grumpy asked Mouse. “We wanted to pounce you,” said Mouse. “So pounce me!” said Grumpy. “It is a rule,” said Mouse. As the story continues, Grumpy “rests his eyes” and his nose begins to snore. I like that the author doesn’t tell us what the boys decide to do. We know what will happen! There’s all kinds of charm in these stories. They’re suitable for a beginning reader to read themselves or for a young one to listen and enjoy. Grandparents will especially enjoy reading these to their grandchildren. You are currently browsing the Sonderbooks blog archives for June, 2018.